December 28, 2018 — A Nissan Altima floorboard lawsuit alleges rust destroys the floor pans from the inside out, but the automaker's motion to dismiss says the plaintiff doesn't have a case about the 2002-2006 cars. The proposed class-action lawsuit alleges the Altima floorboards are so prone to rust that occupants are in danger of falling through. Plaintiff Laura Hays says her 2003 Altima was inspected in 2015 and the passenger floorboard was rusted so severely it would cost at least $4,000 for repairs. The plaintiff says she got a second estimate and paid $459 for a "patch job" on the floorboard. Hays says she sent both estimates to Nissan but the automaker said the car was no longer under warranty. The plaintiff says she traded in the Altima when it had about 103,000 miles on the odometer. The plaintiff sued because the design of the floorboard allegedly allows water to accumulate and rust the area. Hays claims the corroded floorboards allow debris to enter the cars and exhaust fumes to sicken occupants. According to the lawsuit, Nissan allegedly knows about the Altima floorboard rust based on customer complaints going back to 2008. In addition, the automaker issued a technical service bulletin (TSB) about rusted floorboards in Altimas. According to the plaintiff, the bulletin informs dealers to use repair plates over the damaged rusted floorboards. But the lawsuit alleges Nissan forces owners to pay about $500 toward the cost of the repair plates even though the plates cost about $112. Nissan filed a motion to dismiss the lawsuit and told the judge the Altima owner has no legal case because she drove the car without any problems for 12 years and her basic warranty coverage expired in 2006. In addition, the corrosion warranty expired in 2008, so the plaintiff has no right to expect Nissan to pay for repairs. As for the plaintiff paying $459 to fix a rusty floorboard, the work was performed seven years after the corrosion warranty expired, then Hays sold the Altima when it had about 103,000 on it. Nissan says the plaintiff told the buyer of the Altima the car was in "good condition," but a year after selling the car she sued Nissan claiming the floorboard prematurely rusted through. According to Nissan, the plaintiff's car didn't experience premature rust, so the judge should toss out the lawsuit. 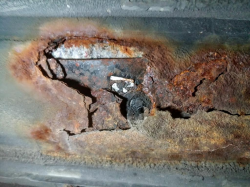 As for express warranty claims, Nissan argues the claims fail because the corrosion warranty expired in 2008, years before the plaintiff says her floorboard rusted. But even if the problem occurred during the warranty period, "her claim would have accrued no later than 2008, and the statute of limitations would have run in 2012." Nissan says the same argument applies to implied warranty claims, and as for claiming the car was "unmerchantable” at the time she bought it, Nissan says that argument is absurd because Hays drove her Altima 12 years without any issues. The automaker also argues the plaintiff's fraud-based claims of concealing the alleged defect don't fly because Hays doesn't provide any evidence Nissan knew of a problem when the car was purchased in 2003. The Nissan Altima floorboard lawsuit was filed in the U.S. District Court for the Western District of Missouri - Laura Frances Hays, et. al., v. Nissan North America, Inc, et. al. The plaintiff is represented by Williams Dirks Dameron LLC, Stueve Siegel Hanson LLP, and Dollar, Burns & Becker. Road salt. It's great for melting ice, and awful for just about everything else.